To measure for women's & girls' Custom tailored or Made-to-order garments, follow the instructions below. Step 2: Follow each of the measurement instructions, below, and write down the measurements (in inches) in the corresponding box (on your printed pages). Some garments require only a few of the measurements ~ please see the order form for that garment for specific measurements needed. *Please note, measurements must be made per the instructions without any allowance or extra margin. Allowances will be made by the tailor. You'll need a flexible tape measure (inches) and someone to help you place and read the measuring tape. As we say in the tailor shop... "measure twice, cut once."... and you'll get more accurate measurements. Step 3: With your measurements ready, go back to the item you've already chosen and enter your measurements in the order form. B. The level where you want the garment to end. Measure from the bony protrusion at the back of the base of the neck, straight down the middle of the back, to the level where you want the garment to end. For garments with "tunic length," the "back length" is measured to the level of the knuckles of both hands (resting at the side of the body). A. Base of neck, in back at (biggest) bony protrusion. Measure from the bony protrusion at the back of the base of the neck, straight down the middle of the back, to the floor. - to (D) the wrist or the point at which you prefer the cuff to end. 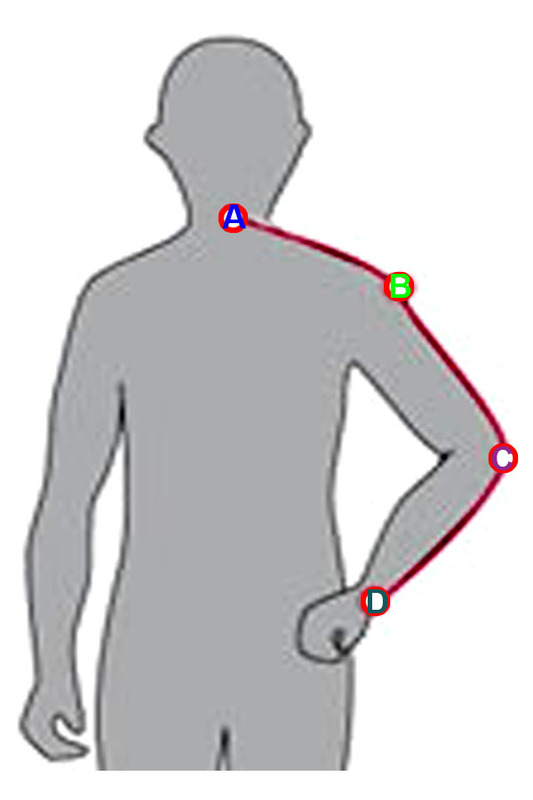 *A 3/4 sleeve should end halfway between the elbow and wrist . Measure from the belly button, vertically down to the level of the floor. A. Just as in measuring the lower bust, wrap around the back of the torso, keeping the measuring tape up and close to the arm pits, but guide the tape measure up just above the breasts in front. Hold the ends of the tape in front of your chest so that you could see the measurement. Provide a gap to allow one finger to enter between the tape and your chest. Ensure that the tape is straight from back and parallel to the floor. Be relaxed and breathe normally. Put starting point of the tape at the thickest part of your neck. Take a full circumference of the neck with the tape around your neck gently. Loose the tape a little to allow your index finger to enter between the tape and your neck. Make sure you are not wearing a collared outfit while taking the measurement so that you do not provide extra margins to your neck size. Measure your bare neck. Measure the desired length of your sherwani coat with this simple and quick method. Put the starting point of the tape at the highest level of your shoulders (normally the joint of shoulder). Keep the tape straight and to ensure it let the tape follow your length itself and don't hold its other end that's reaching to your knees. Then take it to downwards 4 inches below the knees. Take the tape horizontally from one shoulder tip to the other across the back. Keep the tape straight and parallel to the floor as shown in the image here. Make sure the tape goes to the extreme ends of both the shoulders. Start measuring the length of the sleeves from one shoulder tip i.e. the outer edge of shoulder bone. Take the tape down along your arm to elbow and then toward wrist or the desired length of the sleeves. Make sure you measure both the arms separately. The place above waist around navel is the stomach area. Make a loop with the tape around the widest part on stomach. Let the tape loose enough to allow one finger to rest between the tape and stomach. Be at ease and breathe normally so that it doesn't give extra margins to your belly measurement. Waist is the part of the body, where you tie your trousers (bottoms) normally. Its measurement is also very quick and simple enough. Simply take a loop around it while keeping a finger between the tape and the waist and you are done. Take a full circle of your hips with the tape. Keep the tape parallel to the floor. Allow a finger to enter between the tape and your hips so that you don􀀀t provide extra margins and get perfect fitting. Stand still in a comfortable position. Measure one leg from underneath of the crotch to the bottom side of the ankle i.e. below the heels touching the floor. Stand straight and place starting end of the tape on your waist at the point where you normally tie your bottoms. Take the tape straight measuring down to your ankle to touch to the floor or at the point where you want your bottoms to end. Place the tape at the fullest part of your upper thighs. Measure it by wrapping the tape around it straight. The tape should be loose enough to let your one finger enter between the tape and your thigh. Take the tape around fullest part of your knee to make a full circumference around it. Let the tape be parallel to the floor. Keep one finger between the tape and your knee while measuring. Make a slight bended loop with the tape around largest circumference your ankle joint. The bend should cover your heels touching the floor. Leave the tape loose enough to allow a finger rest between the tape and your ankle while measuring. Simply take the tape from head to the floor. While measuring keep yourself and the tape straight. Please Email Us with your measurements, include your name and phone number.